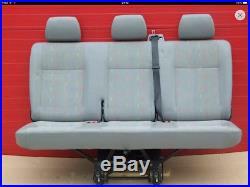 For VW Transporter T5 Triple Bench as shown in below image. 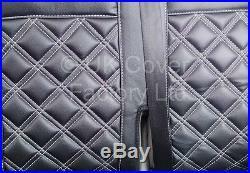 We have used the images from the first row 1+2 layout, however this is a made to measure seat cover for the triple bench as shown in the images. 1x One piece complete upright. 1X One piece complete base. This is our's TOP MOST QUALITY RANGE!!! How many days before you dispatch the item? 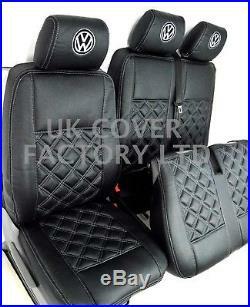 My van seats look different to the images? Will this fit my van? - A PERFECT SPOT ON FIT!!! I do not want a loose or a baggie fitting seat cover, will they be a good fit. 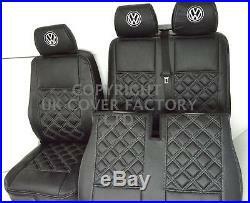 What information do you need from me to make a fully fitted seat cover from my van? 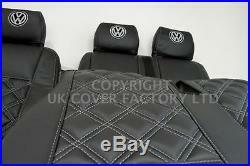 This seat cover will be a near inch fit as shown in the images. The images have actually been taken on a T5 van seats. Arm rest covers are not part of the listed price. / What fabric is this? / Can it be washed? A complete waterproof, dustproof, stain proof fabric. This can be wiped clean with a sponge using a mild detergent / cleansing agent. A wet wipe clean and your van is as good as new. Do you recommend this product? 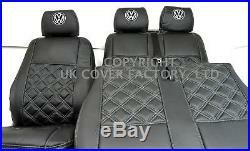 We try to use accurate descrptions and real product images when we advertise our seat covers. We are genuine with our pricing which is based on products worth not what the market can pay. At UK Cover Factory Ltd - "You get what you pay for". Is this is a good protective fabric? 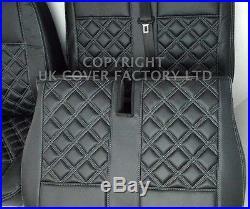 What may seem like just another design to you is a carefully engineered seat cover. The quailted diamond stitch design increased the comfort due to extra thick foam. 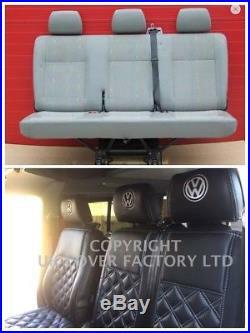 When you are in and out of your van, most of the wear and tear takes place on the out side edges of the seats, pvc leather used on the remaining part of the seat cover assures completion protection for your van. Recommend Tailored Fit When you shop online for protective seat covers, fititng style is very important because- Functionality. Over all make of the seat cover is important- A universal one piece seat cover which goes over the head rest and complete seat in one go will be equally good with the protection (assuming that the fabric used is good) but when it comes to long term usage and being able to use all the various features storage/ coffee table/ adjustable head rest / arm rest covers etc on your van seats a universal seat cover may not be desirable. We only customised seat covers which means there will be a provision for coffe table, arm rest opening and , storage etc using zips, velcro and stiched openings. In some designs we ask customer to make head rest holes using a stanley knief as this will ensure that there is no crease around the base of head rest chrome bars. Which goes over the head rest and complete seat in one go. May start to loosen over a period of time (owing to the fact that every time you sit on it the seat cover is pulled from top to bottom), where as making them with separate head rest head rests allows the body weight to be equally spread over individual seat cover. Each part of your OEM seat is individually covered. Alternatively you may pick from a range of colour options. The item "PREMIUM- VW TRANSPORTER T5 TRIPLE BENCH VAN SEAT COVER GREY BENTLEY" is in sale since Thursday, September 14, 2017. This item is in the category "Vehicle Parts & Accessories\Car Parts\Interior Parts & Furnishings\Other Interior Parts & Trim". 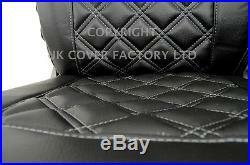 The seller is "ukseatcoverfactory" and is located in Salford.